Please note that Bouncin' Bunch and Tropical Punch have slightly different ingredients. Full details are on respective pages. Children aged 3 Years: As a dietary supplement for children, take one (1) chewable tablet daily, or as directed by a healthcare practitioner. Adults and Children 4 Years and Older: As a dietary supplement for adults and children, take two (2) chewable tablets daily, or as directed by a healthcare practitioner. If you are taking any medication or have a medical condition, please consult your healthcare practitioner before taking any dietary supplement. In case of accidental overdose, call a doctor or poison control centre immediately. Not formulated for use in children under two years of age. 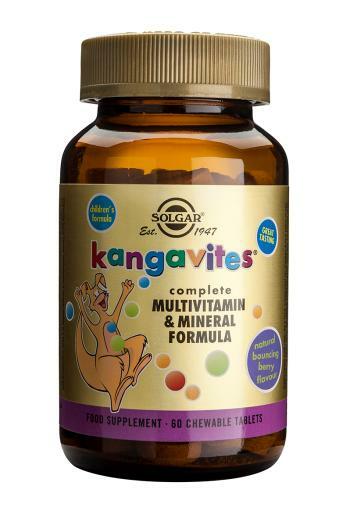 Solgar Kangavites Complete Chewable Tablets are free of dairy products and are formulated without the use of preservatives, artificial flavours or colours.